Hillsboro’s Brennen Priest slides into third base on Tuesday at Shaffer Park in Hillsboro where the Indians hosted the Western Brown Broncos in a non-conference baseball game. 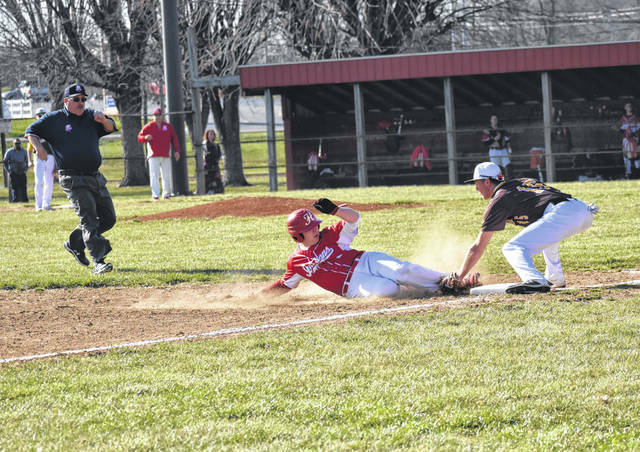 The Hillsboro Indians varsity Baseball team hosted the Western Brown Broncos on Tuesday at Shaffer Park in Hillsboro and forced extra innings after relinquishing a four run lead but were unable to overcome the Broncos and lost 6-5 in eight innings. Ethan Watson got the start for the Indians and pitched three and one third solid innings against the Broncos but allowed seven hits and walked a batter while allowing five runs to score. Ryan Scott came on in relief in the fourth inning and pitched the remainder of the game against Western Brown while allowing one hit and walking two. The Broncos scored the game winning run in the top of the eighth inning when the Indians second baseman was unable to corral a hard hit ground ball. Western Brown secured the win in the bottom of the eighth inning, despite Brock Haines drawing a walk in the second at bat of the inning, when Scott grounded into the game ending put out. The Indians got off to a good start offensively and scored four runs in the bottom of the first inning to take a 4-0 lead. Scott got things started in the lead off spot for Hillsboro when he was hit by a pitch, Jared Thompson had a single from the three spot in the inning and was driven in when Dylan Boone singled with two outs. Boone and Luke Magulac each scored on errors in the inning as Boone scored on an error during Brennen Priest’s at bat and Magulac scored on an error during the at bat of Tanner Warner. The Indians were able to add a fifth run in the bottom of the fourth inning when Magulac crossed the plate for the second time in the game on a sacrifice fly off the bat of Ethan Humphries. Western Brown scored four runs in the top of the second inning to tie the game at four and took the lead in the top of the third inning before allowing Hillsboro to tie the game in the bottom of the fourth. Hillsboro Head Coach Matt Garman was pleased with the performances of his pitchers in the game but not the defense that was behind them in the field. Garman said that his team will continue to work on fielding the ball more consistently as the season goes on but noted that if his team continues to play like it did against the Broncos they will have a hard time beating anyone. Hillsboro travels to Washington High School this evening to take on the Washington Blue Lions in a Frontier Athletic Conference matchup.